Made by Cumberland Newpapers Pty Limited in Sydney, New South Wales, Australia, 1967. Program for Rugby League football fixtures on the weekend of 15 and 16 April 1967. Paper magazine style booklet, staple bound, 24 pages, one colour printed cover, monochrome printed text and photographs. 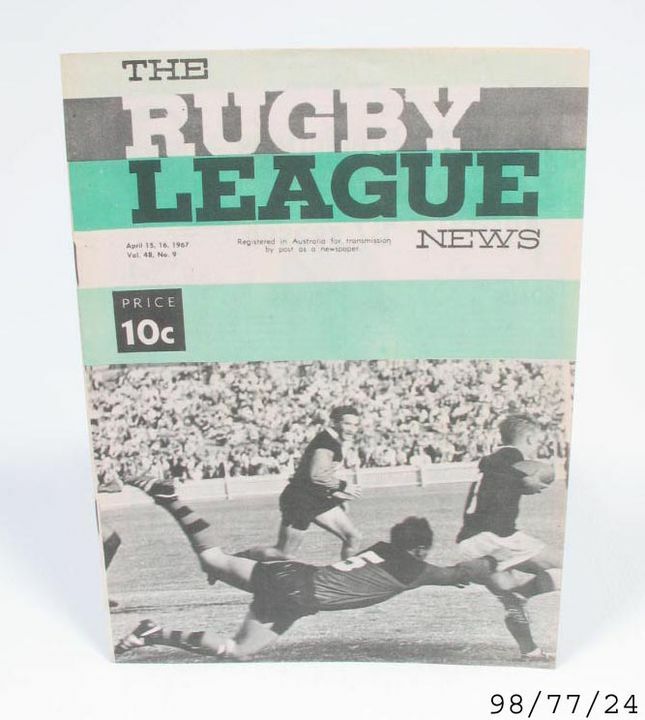 Cover in green and monochrome features text above black and white photograph of a North Sydney player missing a tackle on a Newtown player with text 'The Rugby League News, 15-16 April 1967, Vol.48, No.9'. Lists all players and their positions. This was a normal week of club matches including Manly V Penrith, Parramatta V Western Suburbs, St George V North Sydney, Balmain V Canterbury, Newtown V Eastern Suburbs, South Sydney V Cronulla. Published by the New South Wales Rugby Football League, printed by Cumberland Newpapers Pty Limited.